Recently, I spoke with someone who suffered a shoulder dislocation and has a lot of shoulder pain. She wanted more information about treatment and prevention. She also questioned a shoulder dislocation verses a shoulder separation. She also wondered if a clavicle fracture was part of this as well. The answer is that a fracture is usually its own injury. The two types of shoulder dislocations are quite different from each other, but they affect the same overall location namely the shoulder. Let’s take a closer look at the two different areas of injury. The key is to determine which Joint is affected. The primary way to do this is to perform an essential procedure – an X-ray – to determine what joint is affected. The X-ray can show a variety of things from a broken bone, dislocation, separation, or something else. Today we are only looking at dislocations and separations. But keep the other possibilities in mind. This deals with what is referred to as the AC joint of the shoulder or the acromioclavicular joint. The AC joint is located at the far end of the clavicle, towards the end of the shoulder. It can be seen in the picture above. When an AC joint is “separated” it means that it has been injured to some severity. No…. Separated shoulders are graded according to the severity of the injury and the position of the displaced Bones. – Is an injury to the capsule that surrounds the AC joint. – The primary symptom is pain. – Additional injury to the important ligaments that stabilizes the clavicle. – This ligament, the coracoclavicular ligament is often partially torn. – Symptoms include pain, decrease motion, and a possible small bump over the injury. – In addition the injury is more severe and damaged. – Ligament tearing is more severe. – Ligament tearing is more severe and can be complete. – In some rare cases the clavicle is pushed behind the AC joint. – Types I and II often require ice, pain medication, shoulder sling, and time. – Types II and III include those for the other types. In addition, surgery, PT and other treatments may be necessary. The joint of the shoulder consists of three Bones that come together at one place. The arm bone (humerus), the shoulder-blade (scapula), and the collarbone (clavicle) all meet up at the top of the shoulder. The joint between the humerus and scapula, also called the glenohumeral joint, is a ball-and-socket joint. The ball is on the top of the humerus, and this fits into a socket of the shoulder-blade called the glenoid. This joint is effective and multidimensional as it allows the movement of shoulder though a large arc of motion. 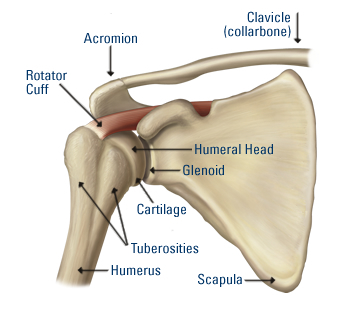 There is no other joint in the body that allows more motion than the glenohumeral joint. Unfortunately, by allowing this wide range of motion, the shoulder is not as stable as other joints. Because of this, shoulder dislocations are not uncommon injuries. – 95% of all shoulder dislocations are anterior or forward. – Posterior dislocations are behind the shoulder. – They are possibly due to strength imbalance of the rotator cuff muscles. Other causes include falls, sports injuries, and other. – Can occur and go unnoticed in elderly patients. – Are the least likely to occur with less than 1%. This can turn into a situation with large amount of complications. Blood vessels, nerves, tendons, and ligaments can be affected. – Reduction – a process to return the shoulder back into the correct joint. – Surgery is necessary in the more severe cases or is considered when chronic shoulder dislocations occur.